As fall foliage reaches peak colors in Hancock County, the Downeast Scenic Railroad will have a celebrated final three weeks of its first season. It’s been four years since the Downeast Rail Heritage Preservation Trust went to work and for the first time this summer its historic rail line started running scenic trips through the Hancock County countryside. “It was abandoned in 1985. We showed up four years ago. Then it was just sort of sitting there, nothing was happening to it. It presented itself just as this great opportunity to (rebuild) a really historic rail line with all the tourists coming through this area. It is absolutely the ideal place with an ideal rail line to put tourists on a railroad, which we have done,” Alexander said. The preservation trust has received grants and donations from individuals and corporations. But the muscle that went into moving railroad ties, cutting trees and restoring old railroad cars is what put the Downeast line back on track. “There are four people working on one of the coaches refurbishing it. That work will continue right through the winter. There is a tremendous amount to it,” said Tom Testa, president of the 350-member trust. Bringing more tourism to the area and bringing back to life the vibrant history here was the motivation. The train line built in 1884 became the primary route for wealthy summer tourists heading to Bar Harbor in the late 19th and early 20th century. Back then as many as six to seven trains ran from Ellsworth to Frenchman’s Bay and back, ferrying tourists to the steam ship that brought them to Bar Harbor, according to the trust. “Probably from the ’20s on, the rich cottage owners on Mount Desert Island with those amazing homes, this was their way to come up. They’d get on the train in New York City or down in Washington, D.C., or in Philadelphia or in New Haven and would come up to Bangor. Then they’d get on this rail line and take it down to Ellsworth,” Alexander said. From there they got on a line to the Hancock peninsula, and at Frenchman’s Bay they would take a boat over to Mount Desert Island. Today the rail line is owned by the Maine Department of Transportation and leased to the preservation trust. The goal is to run seven days a week. Now roughly 10 miles of the 22-mile round trip excursion is open. But Testa said 26,000 volunteer hours over five years have been spent on the project, and there is no sign that effort will slow. “You know it just came together. The people that came out to help, whether they donated an hour or a dollar, everybody and anybody that has participated has helped this project,” said Testa, owner of Testa’s Restaurant in Bar Harbor. To Testa it might mean the most. His family has run a restaurant in Bar Harbor for 76 years. He was born and raised in Bar Harbor, but he has family stories of train travel from Florida, where Testa owns another restaurant. “It’s one of those things that had been a part of the way of life. 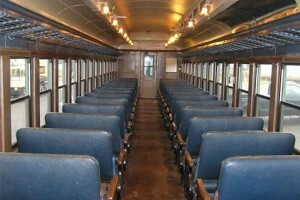 I can’t tell you how many people that have come to ride the train have memories of leaving the Ellsworth depot. This train was the way of life, the transportation mode at the time,” Testa said. But many who lack that family history are still inspired. It’s an addiction Alexander said will spread. “There is a core of probably 16 to 18 men and women who come and work on Saturdays and Sundays, whatever has to be done: Digging ditches and cutting trees. I’m down in Waterville and it’s 70 miles for me. And there are people who come from farther,” he said.